each time that Grandma stews you. and change your label to "dried plum"
gourmets decide to choose you. some terms they wish were finer. they'll soon march past the larder. instead of death, we'll have "dried chi;"
instead of hate, "dried ardor." don't be the latest upscale hit. Who's so thoroughly, willfully odd. Her lipstick is always a mess. This does not get her asked out to tea. Her headbands aren't quite comme il faut. More appalling than ever before. If you knock, she won't answer the door. Her complexion grows whiter and whiter. She wears the most horrible shoes. You can certainly tell she's a writer. How unpleasant to meet Mrs. Hughes! Melissa Balmain has been a featured poet in Light Quarterly; her poems have also appeared in The Spectator (UK), The Chimaera, The Formalist, Measure, and Bumbershoot. She is a two-time finalist for the Howard Nemerov Sonnet Award, and the proud winner of the 2009 Rubber Ducky Sonnet Award from the New England Shakespeare Festival. She's a director of the Foundation for Light Verse. 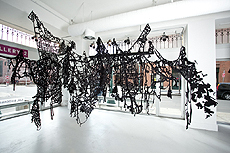 Gail Biederman: I use sewing as a form of drawing, as one way to alter a surface. Thread is my line, a physical presence that hovers in space in my installations. With both a cast shadow and an edge that catches the light, thread creates multiple realities, a jumbled mix of hard and soft, the solid and the ephemeral.